Chevron Pink Bridesmaid Badge in pink and white chevrons with bridesmaid written across the badge in a lovely white font. 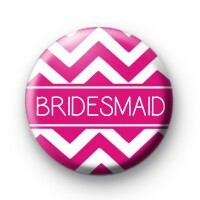 These badges are so cute & this chevron design badge is available with other text such as bride, mother of the bride & various other bride related text. Our wedding badges are some of our most popular badges and we have hundreds of wedding badges & hen party badges available on the website. We have badges for every person in your wedding party & we even also badges which can be customised for your hen do at no extra cost. We have hundreds of hen party badges & wedding badges to choose from, so be sure to browse through our categories & grab badges for everyone at the wedding. Standard 25mm badge made by hand in our UK workshop & available with worldwide delivery. Free delivery available. We also offer a next day delivery option for any last minute wedding badge or hen party badge orders. Delivery options are available during checkout.